A detailed description of this pistol can be found here and here. 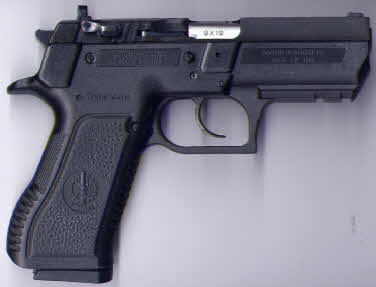 The Baby Eagle, or as it's also known, the Jericho 941, was developed and made by the Israel Military Industries (IMI). IMI is fully owned by the Government of Israel. Lately the hand gun operation was privatized under the Israel Weapons Industries (IWI) name. The general design is derived from the CZ75 and was finalized in cooperation with Tanfoglio - an Italian gun manufacturer that also makes CZ based pistols. The Jericho 941 was originally made in two calibers: 9x19 Luger and .41 AP. The .41AP is similar to the 9 mm in casing extraction dimensions and is almost identical to the .40 S&W in performance. The model designation number 941 was derived from the two original calibers. The .41AP failed in the market - mostly due to a lack of marketing effort and the Baby Eagle has not been made in this caliber for a number of years. The Jericho is used in Israel by Police, private security companies and to some extent by the Army. Use of hand guns by the Army is very limited. It has been exported to government agencies in other countries. The Baby Eagle designation was introduced by Magnum Research - the sole importer to the U.S. of the IMI Desert Eagle. They tried to build on the Desert Eagle's market success. The two pistols have nothing in common, except for being manufactured by the same company. The Baby Eagle is a Double/Single Action pistol with a decocker and firing pin block. If the hammer is not cocked and a round is in the chamber, this round can be fired by pulling the trigger. The trigger pull is fairly hard but smooth, with a clean break. The hard trigger pull reduces the accuracy of a first round fired in DA. Subsequent rounds are fired in single action with a smooth and crisp trigger pull. It is also possible to fire the first round in Single Action (SA) by simply cocking the hammer. The pistol uses the basic Browning design with short recoil and tilting barrel. A Picatinny (MIL-STD1913) accessory rail is standard and makes mounting standardized accessories very easy. The combat sights shown on the right come standard and are very good. 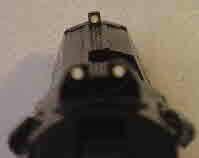 Tritium sights are available. The sights are fixed, dovetailed into the slide and adjusted at the factory so that the point of aim and impact coincide at 25 meters. We tested the gun thoroughly and have to admit that it is more accurate than our tester. We had no difficulty achieving 1" groups at 15 yards. To achieve the advertised 1" groups at 25 meters we had to use a fixture to hold the gun and reasonably accurate Lawman ammo. The gun is pleasant to shoot (at least our 9 mm model is) and this also contributes to its accuracy. Though our semi-compact polymer framed model is not small it is well designed and was comfortable in our tester's small hands. The gun's design, with the frame guides gripping rails on the outside of the slide contributes to accuracy as does the good sight radius. The Baby Eagle is easy to disassemble and easy to clean. After the slide is pulled back a short distance to match the markings on the frame and slide, the assembly pin comes out with finger pressure. The highly internally polished polygonal rifling makes cleaning a breeze - even after shooting a couple of hundred rounds of dirty Russian ammo. We also noticed that after 200 rounds of Brown Bear (which is DIRTY) there was almost no deposit on the inside of the slide or frame. It seems that the powder combustion products leave the barrel before the casing is extracted. Several manufacturers make magazines for the Baby Eagle. In theory any magazine made for the CZ75 or the EAA Witness (Tanfoglio) should fit. We tested only two brands: the Promag 16 round magazine for the CZ and the IMI 10 round and 15 round magazines. All three work well. Surprisingly, the IMI 15 round magazine rattles a bit due to a small gap between its bottom and the bottom of the grip. A piece of electrical tape resolved this annoyance. The IMI magazine also held and reliably shot 16 rounds. As is shown in the table above the Baby Eagle can be had in a full size version with a steel frame, a semi-compact with either steel or polymer frames and a compact also in steel or polymer. In practice our research shows that the most popular in the U.S. are the two polymer framed variants. We don't know which caliber sells best. Our pistol is the 9x19 Luger and it proved very reliable and accurate. A conversion to .40 S&W. 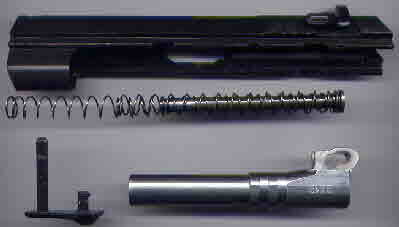 is simple - a .40 barrel, a new recoil spring and the appropriate extractor. All parts are available either from Magnum Research or IWI. The Baby Eagle (or Jericho 941) is a reliable and accurate firearm. In our tests it performed flawlessly and is still going strong after about 1500 rounds. It is NOT sensitive to ammunition and digested everything we fed it: from Russian Wolf and Brown Bear to Hornady +P+ and a lot of different stuff in between. Surprisingly the +P+ doesn't feel much different to shoot than regular 9 mm loads. This is a good thing as training with "weak" loads will not influence performance with high power ammo. We recommend this hand gun highly for both self defense and plinking.